Flight of the Dragon will be performed by the Frostburg State University Wind Ensemble directed by Shannon Shaker on March 1. The Codebreakers will be performed by the Pinkerton Middle School band directed by Jaime Mangonon on March 9. May Rose March will receive its East Coast premiere at the Massachusetts Instrumental and Choral Conductors Association (MICCA) Concert Festival under the direction of Brian Messier. Flight of the Dragon will be featured as part of the Directors’ Reading Band session led by Karen Wells at the California Music Educators Association (CMEA) Bay Section Conference at San Jose State University. The session will be held on January 11, 2019 at 9:30 a.m. in the SJSU Music Building Concert Hall. The Tulare-Kings County Middle School Honor Band will perform The Codebreakers on January 19, 2019 under the direction of Elisha Wilson. Find me in the exhibition hall at the Midwest Clinic at the Diverse Composers booth hosted by Osti Music (Booth #2040). Friday, December 21: 1:00 p.m.–3:00 p.m. Flight of the Dragon was performed by the Cazadero Music Camp Middle School Concert Band, conducted by Karen Wells. Thousand Oaks Elementary School students play side-by-side arrangements with members of the Berkeley Symphony as part of the orchestra’s Music in the Schools “I’m a Performer!” program. 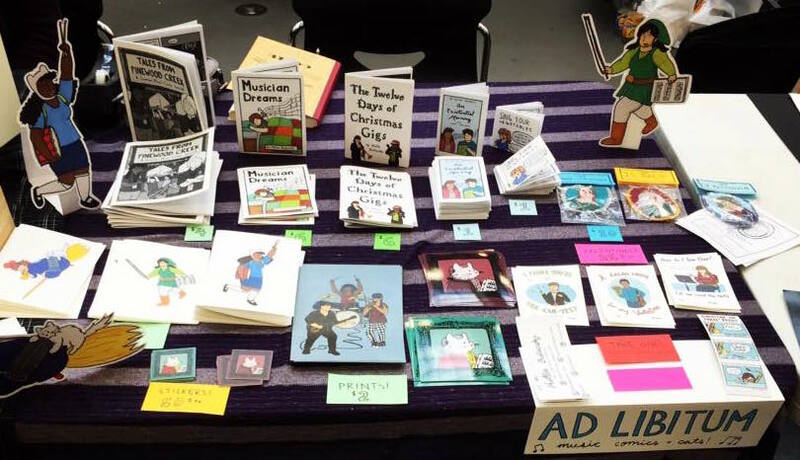 Ad Libitum Comics at SF Zinefest! The Diablo Valley College Symphonic Band, under the direction of Dr. Jonathan Knight, performed Aileron Lullaby at Sonoma State University’s Green Music Center and Diablo Valley College’s Center for the Performing Arts. The California Band Directors Association (CBDA) All-State Junior High School Concert Band premiered Strong to Save with James Mazzaferro conductor, as part of the 2015 California All-State Music Education Conference (CASMEC) in Fresno, CA. The piece, which is derived from the “Navy Hymn” Eternal Father, Strong to Save was commissioned by the conductor and dedicated to his father James John Mazzaferro, who served in the US Navy during WWII. The Gioviale String Quartet, a New England Conservatory honors chamber ensemble, premiered Tales from an Aerophobe as part of their May 1 Jordan Hall recital. 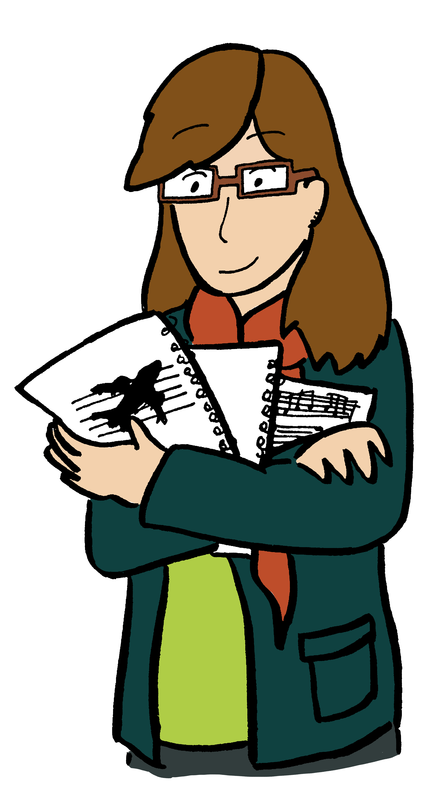 The piece was selected as a winner in the NEC Honors Composition Competition. Music to Keep Bears Away for trumpet duet made its debut on the April 1 Tuesday Night New Music concert, 8pm in New England Conservatory’s Williams Hall; performed by Justin Kohan and Alia Kuhnert. Vessel for stereo playback was selected to be included in the 2012 Vox Novus Pacific Rim Mix, which will premiere 8pm Thursday, February 20, 2014 at the CSU Long Beach University Art Museum. Cactus 1549 was selected to be read and recorded as part of the New England Conservatory orchestra composition readings. The Cazadero Music Camp High School Session Concert Band gave the premier performance of 5000 Austin Creek Road: Fantasy Variations on Cazadero Music Camp, conducted by Dr. Tony Mazzaferro. As part of Cazadero’s Staff Ensemble Night, Lindsay Blackie, Mollie Budiansky, Nicole Galisatus, and Kevin Tang gave the first performance of Tempting the Fates for clarinet quartet. Vessel for stereo playback was selected to be included in the Vox Novus 60×60 (Dance) Environmental Mix, which will be performed at Soka University of America, Aliso Viejo, CA. Vessel for stereo playback included in the Vox Novus 60×60 Athena Mix was performed at the Women Composers Festival, Hartford, CT. Vessel for stereo playback included in the Vox Novus 60×60 Athena Mix was performed at the Harris Museum and Art Gallery, Market Square, Lancashire Preston, UK, on March 8 during the International Women’s Day Festival. They’ve Gone and Sunk the Planetarium (Celestial Music for the Underwater Variety) for stereo playback had its first performance on New England Conservatory’s Tuesday Night New Music concert series; January 27, 8pm in Williams Hall. Vessel for stereo playback was selected to be included in the 2012 Vox Novus 60×60 Athena Mix, which is comprised entirely of works by female composers.